Ironically gratifying to see Y! 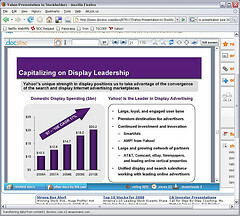 Smart Ads, the initiative I incubated with many wonderful collaborators, featured on this slide about Yahoo’s efforts to maintain a leadership position in display advertising. Part of a shareholder presentation, filed with the SEC in late June 2008, that argues to preserve the company’s present strategy, management team and board of directors.